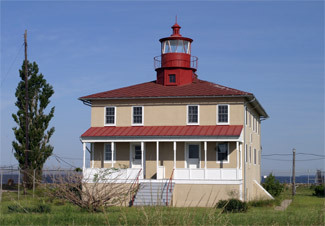 The Point Lookout Lighthouse located at the southern tip of Point Lookout in Scotland, Maryland is considered a hot spot of paranormal activity. Because of treacherous storms in the area many shipwrecks occurred in the years before 1827. Congress finally took note and ordered a small beacon light be built to protect passing ships. This lighthouse was completed in 1830. It originally had one and half stories. After the Civil War this lighthouse was expanded when a fog bell tower was built and porches were built on the front and back of the building. In 1888 water erosion threatened the lighthouse. A wood and steel bulwark was built to protect its cement foundation. Today the building is much closer to the shoreline because of this continued erosion. By 1930 the lighthouse was enlarged to it present size. Hot and cold running water was installed and the house was split into two apartments. In 1939 the station was transferred to the United States Coast Guard. But civilian keepers remained to maintain the light. In 1965, an offshore steel tower replaced the Point Lookout Lighthouse. The state of Maryland leased the buildings to the Navy in 2002 but by 2006 the state of Maryland took control. Today the Point Lookout Preservation Society holds occasional open houses during the day. 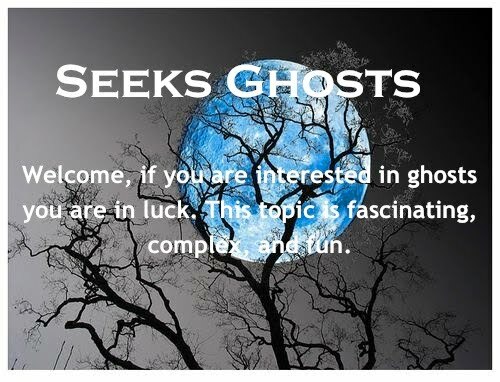 This society allows paranormal groups in to do investigations of the lighthouse for a nominal $50.00 fee. This is a good idea--other preservation societies should take note. The first lighthouse keeper to be assigned to Point Lookout in the early 1830s died within months of arriving. His daughter Ann Davis took over his duties. She remained the keeper until her death in the lantern room while performing her daily tasks. It is said she haunts this building. A famous photograph was taken that shows her ghost standing at the head of the stairs wearing a white blouse and light blue skirt. 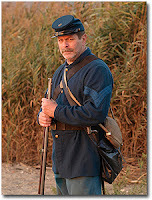 Many of the ghostly sightings at the lighthouse are that of Confederate and Union soldiers. The reason for this is because the Civil War prison camp and hospital were near the lighthouse. One witness Gerald Sword stayed by himself in the lighthouse in 1970. He heard doors being slammed closed, moans and the sound of men snoring and objects crashing to the floor. When he inspected the area nothing was amiss. He also felt cold spots. Many witnesses have seen a Union soldier guarding the steps of the light. Laura Berg--the Secretary of State for Maryland in the 1980s lived in the Point Lookout Lighthouse with her husband in the 1970s. One night while lying in bed she heard footsteps outside her bedroom door. They were heavy as if the person were wearing boots. This sound ended as mysteriously as it began. But the couple continued to hear footsteps in the hall at night. The Bergs also heard other noises. They often awoke to strange smells in the house. One night Berg awakened to see six strange lights over her head. She bolted upright and smelled the odor of smoke coming from the first floor. She ran downstairs and discovered the heater had caught fire. The flames were extinguished quickly. Berg feels that it was the ghosts that alerted her to this danger. Nancy Stallings a medium with the Maryland Committee for Psychical Research is standing in the middle of one of the lighthouse’s’ bedrooms above. A soldier appears in the photo to the right of Nancy. This soldier was not seen by any of the participants. Many EVP’s have been recorded in this lighthouse over the years. One group picked up 24 distinct voices recorded in various places around the house. One EVP captured is a voice stating: “Fire if they get too close to you.“ It is believed this is a voice of a Union soldier guarding the prisoners in the camp. Another EVP picked up in the lighthouse basement is that of shutters slamming in the wind. There was no wind the day this was recorded and the shutters had been removed years before. Here is a must see link that has many EVP’s that have been recorded at Point Lookout Lighthouse. Just click on the word or words in the boxes under the “Sound” category and they will take you to the recording. The second one entitled “drums” is impressive. 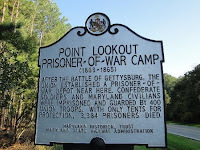 Here is a link to The Ghosts of Point Lookout Part l where I share stories about ghosts from a Civil War hospital and Confederate prisoner of war camp. Point Lookout has made more than one witness a believer in the paranormal. 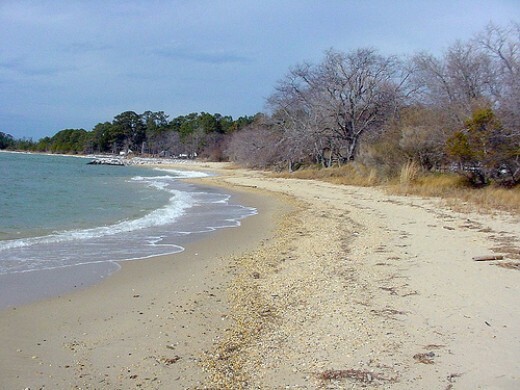 Today, Point Lookout is a Maryland State Park. It is located on a gloomy isolated peninsula that looks out on the Chesapeake Bay to the east and the Potomac River to the west. This patch of ground has seen over 350 years of human suffering. It is here that people were massacred, imprisoned, shot, tortured and starved to death. Add to these tragedies shipwrecks, fire, famine, disease and war and it is no wonder this peninsula is considered very haunted. For thousands of years the native Yaocominco Indians lived in this area. The first Europeans colonized the area in 1612. In 1648 the local natives massacred many of these early settlers. This settlement, established in 1630, was called St. Mary City and became Maryland’s capital. Catholics seeking religion freedom originally populated this area. However, later Protestants moving in turned against the Catholics--eventually banning the Catholic mass. The original families were then driven out of the area and the capital was moved to Annapolis. So many shipwrecks plagued the area that in 1827 Congress ordered a small beacon light built on the peninsula’s point. Seamen also drowned off the Point, its beaches becoming makeshift graves. This lighthouse’s history and hauntings will be discussed in Part ll of this post. The early history of Washington D.C.’s is tied to Point Lookout. In the early 19th century the point became a popular tourist destination. 100’s visited and stayed in its beach cottages in the summertime. For the Washington elite who came to escape the heat they stayed in a fashionable resort hotel called the Fenwick Inn. This inn tragically caught fire and burned down in 1878. During the War of 1812 is when Point Lookout earned its name. The peninsula was used to spot British Ships. 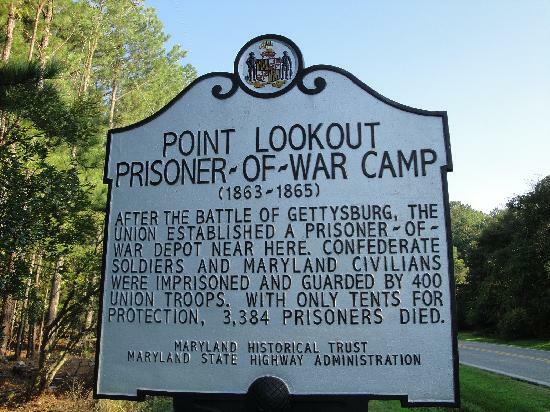 In the Civil War years Point Lookout experienced the most human suffering. At this time there was a Union hospital located on the Point called Hammond. Today its buildings shaped like a spoke of a wheel are long gone. For every one soldier that died here because of war wounds another two or more died of diseases, such as, dysentery, smallpox, typhoid fever and Malaria. It is stated the battle toll rose from 200,000 to 600,000 because of these illnesses. This hospital closed in 1864. Before the war this area was used as a refuge for runaway slaves. 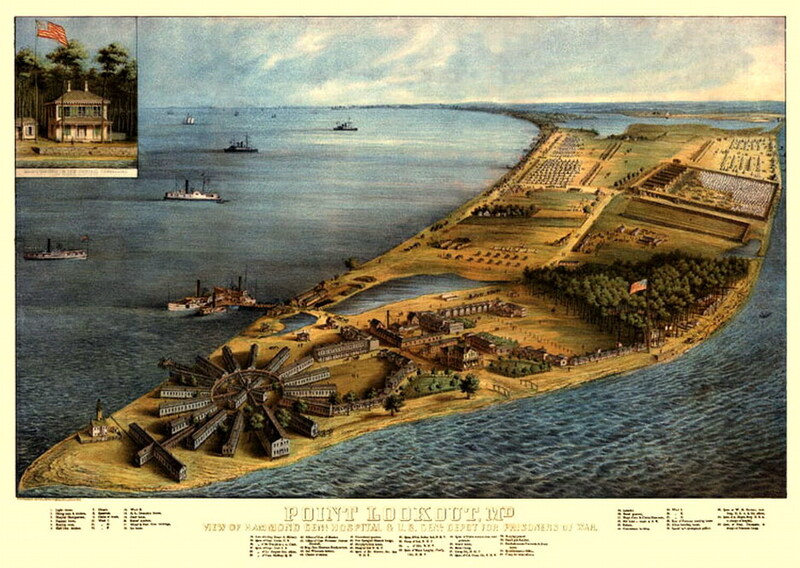 Point Lookout also housed the largest Confederate prisoner of war camp. Camp Hoffman was originally built for 10,000 prisoners but it is said 50,000 plus soldiers were actually kept here. They were placed in open air tattered tents--left to mosquito infestations in the summer and the freezing cold of winter. An imaginary line or trench surrounded this 24 acre camp with the orders that if any prisoners crossed this line they were to be shot. Many were shot. Ironically the camp’s isolation made escape virtually impossible. The Confederate prisoners at this camp called it “ Lee’s Miserables”. They were packed in like sardines. Starvation and disease ran rampant through the area. 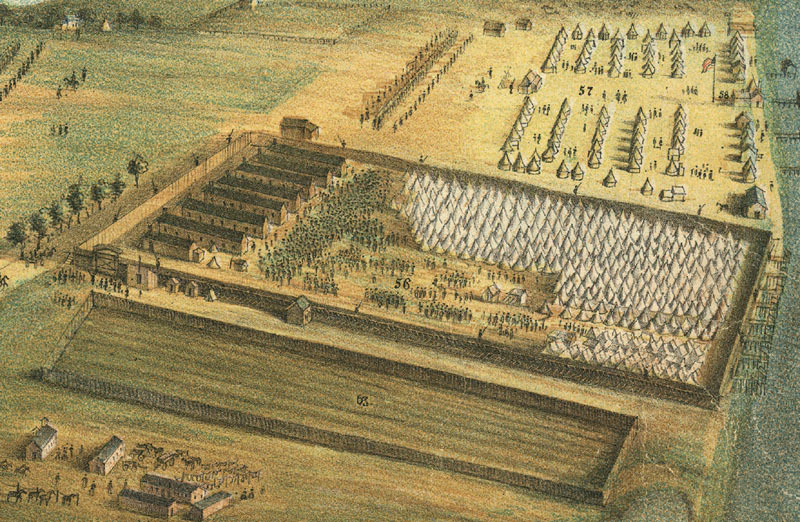 So many prisoners died--an estimated 4,000-- they were initially all buried in a mass grave. Later these bodies were disturbed when they were placed in the “Confederate Cemetery” on the peninsula. Today, many witnesses after they drive past this cemetery are startled to see a still, silent Confederate soldier sitting in the backseat of their cars. A smallpox outbreak on the Point forced the Federalists to establish a separate area for infectious disease. It is in this area that another frequent ghost sighting occurs. A man is seen wearing Civil War era clothing moving across the road at dusk away from were the smallpox unit was located. This gaunt ghost is seen moving very quickly--almost leaping. Witnesses state he reeks of a distinct odor of mildew and gunpowder. His clothes are homespun and ragged. Most feel he is a confederate prisoner who feigned illness hoping to escape. But his plan appears not to have succeeded for he is seen repeatedly crossing this road. He is not aware of the people who see him so this haunting is probably residual in nature. 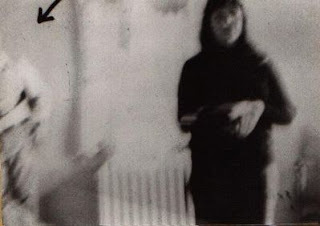 Yet another ghost that has been seen many times is that of an elderly woman. This woman is known to have conversations with the living. She is always seen looking for something. In 1977, Donnie Hammett a ranger on the island reported an encounter with this female ghost. 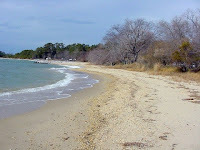 It was early spring and there were not many people visiting the island yet. Hammett was working on the Potomac River side of the peninsula. He spotted an elderly woman looking for something near the beach. He approached her and asked if she needed help. Immediately he noticed his presence seemed to annoy her. She told him gruffly that she was looking for a gravestone. He told her that the nearby Taylor Cemetery had all but disappeared--swallowed up by nature. She shrugged her shoulders and walked on. When Hammett left shortly after this, he was surprised to see that his car was the only one in the parking lot. Later, he discovered that many others had seen this female ghost. She is spotted always looking for her own grave. Hammett has also seen the residual leaping ghost mentioned above. EVP’s picked up on the peninsula include: the sounds of an Indian massacre, shipwrecked seaman shouting and the sounds of captive soldiers. Campers including rangers in the area have seen a variety of ghosts in the woods at night. One witness, a Civil War re-enactor bent down to pick up something when he heard glass shatter and a bullet whiz by his head. When he inspected the area the windowpane was intact and there was no sign of a bullet. 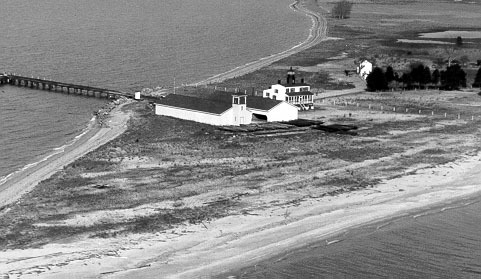 In my next post entitled, The Ghosts of Point Lookout Part ll I share information about the haunted lighthouse on this peninsula. It by far is the most haunted spot on the Point. 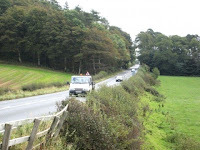 A fifteen-mile stretch of the A75 road, located in the south of Scotland between Annan in Dumfriesshire and Gretna Green is considered very haunted--it is often called the Ghost Road. Over the past fifty years literally hundreds of weird sightings and unexplained accidents have been reported in this area. These reports are so numerous I will share just three of these stories here. Multiple witnesses have experienced what these three accounts describe. Donna Maxwell in July of 2000 was driving back from her mother’s home around 10:00 p.m. Maxwell stated it was a calm night with good clear visibility. So she was surprised as a man appeared directly in front of her car out of nowhere. He then just stopped and stood in the middle of the road. Donna traveling at 55mph had to slam on her brakes. She was so concerned that her car hit this man she went to the Annan police station. The police then searched the road but they did not find the man’s body. Since Maxwell’s encounter several witnesses have reported seeing this man standing in the road looking at cars. Maxwell who does not believe in paranormal activity admits that she no longer will drive this road at night--she takes the bypass instead. An Annan police sergeant, Graham Young became so concerned about these sightings scaring people that he put out a description of this man: “He is in his late 30’s wearing a red jumper and black trousers.” This sergeant grew up in Annan and he takes it in stride that this road is haunted. Another recent sighting of an old lady dressed in Victorian clothing took place many years after the same ghost was seen in the exact same spot. Margaret Ching and her fiancé John were driving from the West Midlands to Gretna on the eve of their wedding. As they approached Domock a mist suddenly appeared in the middle of the road, this is when they spotted the old lady. Their description matched exactly an account that had been told by another witness, Jim Carlyle 26 years before. Ching stated that she could not see this lady’s face but she appeared quickly and she and her fiancé felt they were about to hit her. Instead to their amazement their car drove right through her. When this happened they both felt a strong chill. They looked back but the lady was gone. They reported it was a clear night with no fog or mists. This couple was so shaken up they had to sit in their car for a while before they drove on. Carlyle as a young man had seen this same ghost with his girlfriend when she appeared out of a mist. He slammed on his brakes but his car went right through her. By far the most compelling encounter along the A75 occurred in 1962. Two brothers Dereck and Norman Ferguson were returning home to Annan from a vacation. They stopped for gas around midnight in the town of Dumfries. As they headed down the deserted A75 suddenly a large white bird flew toward their windshield. Dereck who was driving swerved the car to avoid this collision. But this bird didn’t hit their car it vanished as quickly as it had appeared. A short time later the brothers spotted a strange old lady rushing down the middle of the road waving her arms erratically. Dereck again went into a panic thinking their car was about to hit this lady. At the last moment she just vanished. After this things got even weirder. A strange succession of figures including: large cats, wild looking dogs, birds and vague shaped human figures appeared rapidly all seeming to hurl themselves at the young mens' car. Dereck spent the next minutes wildly zigzagging in an attempt to avoid crashing into these figures but they all disappeared before impact. During this time the temperature dropped drastically in the car. But the brother’s now very afraid were drenched in sweat. As Dereck continued to drive he felt some unseen force start to control his hands. This force took over the steering wheel. He found it more and more difficult to turn the wheel. Now suffocating the brother’s rolled down their windows to get some fresh air. They heard an eerie scream and then a high-pitched laugh accompanied by crackling noises. Dereck felt as if something was trying to force them off the road. Finally, Dereck managed to drive the car to the side of the road but as soon as he stopped the car it started to shake violently. He jumped out only to find everything calm and quiet. As he got back in the car it once again started to rock and shake. Both brothers heard a loud ghostly laugh. They then heard what sounded like multiple fists striking the car. Realizing they needed to leave Dereck started to slowly continue down the road. Unearthly figures lined both sides as they drove on. The brother’s were relieved to see the headlights of a large truck heading toward them. But their relief was short lived as Derek felt something take control of the steering wheel once again. Their car was headed directly for the truck. Dereck found he could not slow down or swerve. Just as the two vehicles were about to crash this truck vanished as well. Exhausted the two brothers did finally make it home. They were shocked to discover that all these events happened within 30 minutes. After this experience the brothers discovered that this section of the A75 had been used at one time for witchcraft. Other witnesses on this stretch of road have also seen this large phantom truck heading for their car then it just vanishes. When the Scottish Office announced that they intended to improve this stretch of the A75 recently, many locals gathered in protest. They stated they were afraid this work might “unleash the already angry spirits”. There have been many ghosts spotted and even photographed along the River Thames in London in recent years. The Thames is pronounced “tems” which rhymes with “gems”. 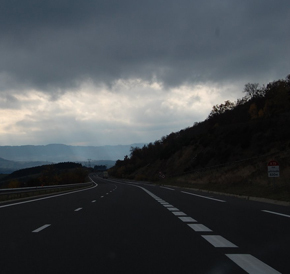 I have shared several stories of ghostly hitchhikers on this blog. The Phantom seen at the Blackwall Tunnel is said to be a hitchhiker. There are two Blackwall Tunnels that run under the River Thames between the boroughs of Greenwich and Tower Hamlets. Stories about this strange hitchhiker started to surface in the early 1970s. 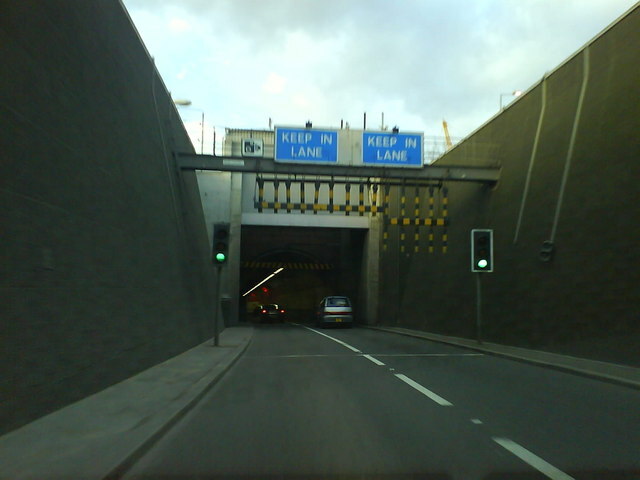 Today, the Blackwall Tunnel is apart of the A102 road. 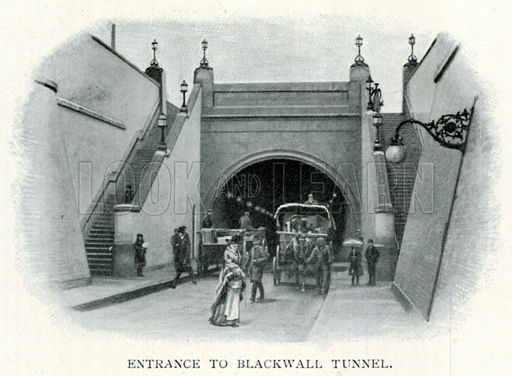 The original tunnel was built in 1897 to improve commerce and trade in London’s East End. By the 1930s this one tunnel could no longer handle the traffic demands. Plans were made for a second tunnel to be built but World War ll delayed this process. It was not until 1967 a second tunnel was completed. Both tunnels originally supported a mixture of foot, cycle, and vehicular traffic. Today the tunnels are no longer open to pedestrian or other non-vehicular traffic. In recent years there have been plans to build a third tunnel but they have been tabled. The stories of this phantom hitchhiker in this tunnel have varied over the years. Some accounts name this ghost as a female others state it is a male. Some stories state this phantom is picked up at the south entrance of the north tunnel. Other accounts state this hitchhiker is picked up in the tunnel itself. This is unusual since there is no longer foot traffic allowed. All accounts mention that it is a Good Samaritan on a motorcycle that gives this ghost a ride. The hitchhiker climbs on the back of the motorcycle and asks to be taken to Leigh-on-Sea in Essex. In all accounts, before the motorcyclist exists the tunnel on the northern bank of the river, the passenger has disappeared. In one account this Good Samaritan feeling the hitchhiker had fallen off desperately searches but finds no trace. In shades of the traditional worldwide hitchhiker stories, this person visits the address in Leigh-on-Sea that was given to him and is told that his passenger actually died years before. The reason given for this ghostly hitchhiker who is described as always wearing biker’s leathers is said to be the result of a 1960 motorcycle accident. This cyclist died just outside the tunnel. It was after this that people started reporting picking up this unworldly hitchhiker. A letter published in the Fortean Times * in 1994 supports the fact this accident happened. A reader recounts an incident in 1960 while he was staying in Blackwall Lane, near the tunnel. He, his father-in-law and his wife all heard an accident outside. When they went outside to investigate they found out a motorcyclist had been killed. One week later he and his wife heard at 2:00 a.m. the sound of the same accident. But this time when they went out to investigate there were no signs of an accident or anything that explained what they had heard. 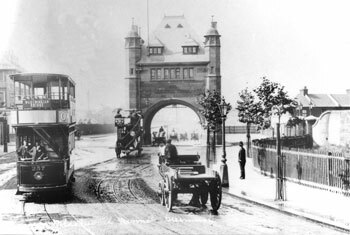 It seems the sounds of this accident also haunt the Blackwall Tunnel. * The Fortean Times is a good resource for anyone interested in a wide variety of paranormal topics. 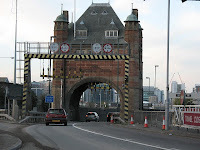 Here is a link to a video of cars driving through the Blackwall Tunnel--it starts at southern entrance gateway. These tunnels travel a long distance underground. What Do Ghosts Know? Do They Have Choices?